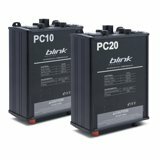 This intelligent, easy-to-use technology is finding applications in the cabins of various different machines in the building and construction sectors. A new product from Blink Marine, an innovative Italian company that can boast an original, technical and efficient commercial approach. The construction market is undoubtedly experiencing a difficult phase, but for Blink Marine, a company that debuted in this field just a few years after it matured important experience in the nautical sector (where it continues to work today as well), it remains a market with strong growth, boasting requests for information and products that arrive from numerous different builders. Blink Marine’s approach to this sector has been almost perfect, especially given the intrinsic characteristics of all the products the company offers, which boast the versatility and flexibility necessary to handle any kind of machinery utilized in construction: from excavators of all sizes to blades; from construction cranes to telescopic lift machines; from dumpers to road vehicles. Not to mention the special automotive sector, including airport vehicles, cleaning vehicles of various shapes and sizes, and a vast range of municipal service vehicles. Blink Marine builds its hardware in Italy, but sells to the world. Europe is the company’s primary target market, as well as considerable interest in Italian-made products from many companies in the US. Blink Marine follows all its markets from Italy, including through commercial collaborations with CIAM in the Cobo Group, a company that works with clients to supply electric systems including those produced by Blink Marine. But what’s surprising about Blink is the complete absence of any sales staff. Sales activities are handled by Blink’s marketing department, which recently launched an online configuration program that allows each individual client to create his or her custom-tailored keypad and order it directly from the website. Many potential clients contact the company in order to understand how Blink Marine products might be useful for their respective companies. At this point the commercial relationship is followed directly by the engineers who know the product: they’ve followed its birth and evolution, and are capable of dialoguing with the client’s technical office, speaking the same language built of questions and concrete answers. This kind of constant dialogue gave rise to the PowerTrack keypad, a new family of products that joins the PowerKey and PowerKey PRO series, all designed for continuous development and expansion, and to respond to diverse needs. This new PowerTrack line is the result of a considerable investment in human resources, design, planning and equipment. 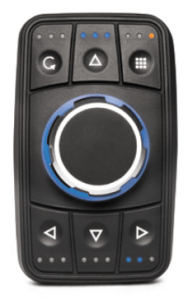 Once again – as was the case for the interchangeable inserts of PowerKey PRO, which are an exclusive offering from Blink Marine– the new product is an authentic litmus test of the Italian company’s design capabilities. 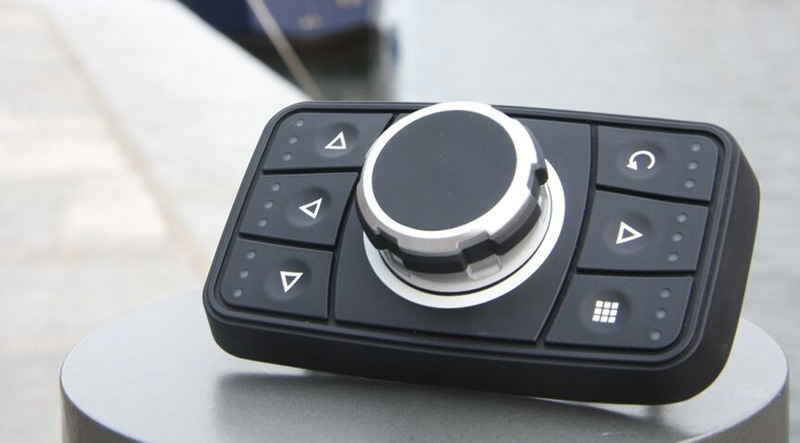 While the term “Power” connects this line with other Blink Marine products, “Track” highlights its specific functionalities: it acts as an interface with the display already present in the vehicle. 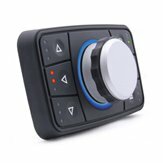 Thanks to its rotary encoder (the central joystick), this instrument makes it possible to navigate within the menus already present in the vehicle’s display. 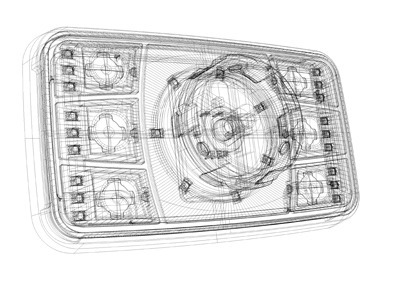 It’s an extremely intuitive application, similar in every way to those found in the most recent generation automobiles. But there’s one big difference: in the automotive world these products are often build specifically for each car model, with all the advantages and disadvantages this brings. The disadvantages mostly have to do with cost. Blink Marine, on the other hand, offers a standardized product that can also be significantly personalized according to the specific needs of each client at a very low cost. 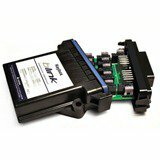 The hardware is provided by Blink Marine, while the software is provided by the client (or by someone working for the client), except for the basic control panel software, which is Fully CAN Open, and therefore provides the client with the utmost flexibility. The pride, care and close attention that went into the PowerTrack project is apparent right from the first time you look at the product, especially in terms of size. PowerTrack is extremely compact and can easily fit into the operator’s armrest. This solution, which is not obligatory but is an intelligent option, responds to a specific evolution that has taken place inside vehicle cabs. “Displays are getting bigger and bigger,” says Arienti, “since they are getting less expensive to make and used to serve an ever-growing number of functions and needs. Clearly this is an advantage for the vehicle, but a large-size display inevitably drives the operator further away due to visual requirements. Therefore the concept of a touchscreen display, which is already relatively unappealing to the construction sector, as are displays with a quick-pick side menu, are becoming increasingly unwieldy and difficult to reach. This gave us the idea to create a navigation instrument that allows the operator ‘comfortable and convenient’ use.” Simply put, excavators, crane operators, drivers and so forth are put in the proper condition to operate their machinery right from the cab of the vehicle. 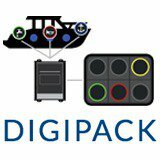 PowerTrack is also equipped with six backlit quick-pick commands designed in a basic layout that can be highly personalized (as is the case with all Blink products) in terms of icons, or laser markers on the exterior. This is not over-molding, but rather a more elaborate procedure that makes it possible to “draw out the transparent white” that allows the light behind the material to pass through. Each client can personalize the button not only in terms of the icon, but also in terms of the number of LED lights, ranging from 0 to 3 for each button. Most uses will remain with the central encoder through the personalized menu, while the buttons are dedicated to the most basic, common functions. Designing the product to fit in increasingly beautiful and sophisticated cabs, Blink worked hard to make the product attractive too. PowerTrack is perfectly symmetrical and can be mounted horizontally or vertically, achieving the same visual impact. While the look is automotive in nature, the rubber frame that characterizes the rotary encoder works to provide an appropriate grip, and is clearly in line with the kinds of machines in which PowerTrack will be used. 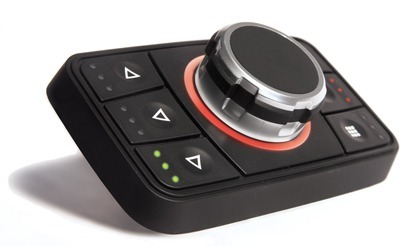 Furthermore, a black disk on the encoder makes it possible for the constructor to further personalize the device, adding for example his or her company logo. The rubber used can be selected from a range of different examples, and the knob is removable, leaving the client completely free to choose his or her preference for this aspect as well. It is also important to note that the presence of multicolour LED indicators for each button with clear colour codes help the operator perform his or her job, and the ferrule around the encoder is enriched with a series of RGB LED lights set at 90° that provide a more diffuse, widespread lighting that can be modulated based on each client’s individual preferences. PowerTrack is also a long-lasting product. All the buttons are guaranteed for three million cycles each, while the rubber is silicon-based for greater resistance. PowerTrack is splashproof, in other words protected from splashing liquids (inside a cab, this could take place whenever the operator spills a drink). 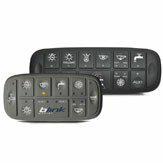 All other Blink keypads are IP67, in other words fully waterproof in the event of immersion, though this would be superfluous in the case of a device destined for internal vehicle use. Beautiful, functional, solid… What about price? Here Blink unveils what may well be the company’s greatest surprise: the pricing for PowerTrack is decidedly competitive. This is an added benefit that should open up a host of new possibilities for a product that Blink believes it will be producing in large numbers. These estimates should soon become reality, bearing in mind the countless application fields for PowerTrack in markets around the world.